Andrew Bruhacs Andrew Bruhacs is a trained chemist who graduated with a diploma degree from the Johannes-Gutenberg University in Mainz, Germany in 2008. During this period, under the supervision of Prof. WolfgangTremel he published works regarding the synthesis, characterization and tribological applications of transition metal chalcogenide inorganic fullerenes, in collaboration with the LTDS institute in Lyon. His knowledge in organic and computational quantum chemistry later led to collaborations with the Carr-Parrinello MD simulation group of Prof. Radu Iftimie at the Université de Montreal, Canada where he set the stage for modeling excited state proton transfer (ESPT) processes in aqueous media. 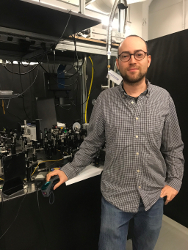 To deepen the understanding of ESPT further, during the start of his PhD at McGill University he built and conducted femtosecond broadband pump-probe spectroscopy experiments covering the UV/Vis and mid-IR in the ultrafast structural dynamics lab of Prof.n Bradley Siwick. In collaboration with the team of Prof. Mohamed Chaker at INRS-EMT he discovered and characterized a metastable ultrafast photo-induced phase of vanadium dioxide (thin film) using mid-IR spectroscopy as well as sub-picosecond ultrabright electron pulses. Following his graduation from McGill University in 2015 he is currently working as a post-doctoral researcher (since April 2016) in the nonlinear photonics group of Morandotti, focusing on technologies for THz generation, detection as well as THz thermal imaging applications in biological tissue. In 2017 he was granted a 2-year FQRNT fellowship to pursue work on adiabatic three-wave mixing in temperature-controlled bulk crystals as well as the theoretical study nitrogen ion lasing phenomena in laser-induced plasma sparks. Markov, A., Mazhorova, A., Breitenborn, H., Bruhacs, A., Clerici, M., Modotto, D., Jedrkiewicz, O., di Trapani, P., Major, A., Vidal, F., and Morandotti, R., “Broadband and efficient adiabatic three-wave-mixing in a temperature-controlled bulk crystal”, Optics Express, 2018, 26, 4, 4448–4458. Tannous, J., Dassenoy, F., Bruhács, A., Tremel, W., “Synthesis and Tribological performance of Novel Mo x W 1−x S 2 (0 ≤ x ≤ 1) Inorganic Fullerenes”, Tribology Letters, 2010, 37, 83–92. Tannous, J., Dassenoy, F., Lahouij, I., Le Mogne, T., Vacher, B., Bruhács, A., Tremel, W., “Understanding the Tribochemical Mechanisms of IF-MoS 2 Nanoparticles Under Boundary Lu-brication”, Tribology Letters, 2011, 41, 55–64. Rivard, U., Thomas, V., Bruhács, A., Siwick, B.J., Iftimie, R., “Concerted and Sequential Proton Transfer Mechanisms in Water-Separated Acid-Base Encounter Pairs”, J. Phys. Chem. Lett., 2012, 5, 2633–2637. Thomas, V., Rivard, U., Maurer, P., Bruhács, A., Siwick, B.J., Iftimie, R., “Donor–Bridge–Acceptor Proton Transfer in Aqueous Solution”, J. Phys. Chem. Lett., 2014, 5, 3200–3205. Morrison, V., Chatelain, R., Tiwari, K., Hendaoui, A., Bruhács, A., Chaker, M., Siwick, B.J., “A photoinduced metal-like phase of monoclinic VO 2 revealed by ultrafast electron diffraction”, Science, 2014, 346, 445–448. Morrison, V., Chatelain, R., Hendaoui, A., Bruhacs, A., Chaker, M., Siwick, B.J. Gordon Research Conference X-Ray Science (2015): ‘Structure and Dynamics with Ultrafast Electron Microscopes’. Siwick, B.J. *, Bruhacs, A., et al. 4th Banff Meeting on Structural Dynamics (2015), Ultrafast Dynamics with X-Rays and Electrons: ‘Photoinduced phase transition in VO 2 revealed by ultrafast electron diffraction and broadband spectroscopy’. Siwick, B.J. *, Bruhacs, A., et al. RQMP (2014) conference poster: ‘Structural dynamics of the metal insulator transition in VO 2 . An ultrafast electron diffraction study using radio frequency compressed electron pulses’. Morrison, V.*, Chatelain, R., Tiwari, K., Hendaoui, A., Bruhacs, A., Chaker, M., Siwick, B.J. Crossborder Workshop on Laser Science Ottawa (2009), and Montreal (2012), organizer. STLE Florida (2009), oral presentation of diploma work: 3J-Nanotribology III – Nanoparticle Research: ‘New Inorganic Fullerene Nanoparticles (Mo x W 1-x S 2 ): Influence of the Stoichiometry on the Tribological Properties’. Dassenoy, F.*, Bruhacs, A., Tannous, J. Diploma work referenced in 40th Leeds-Lyon Symposium on Tribology & Tribochemistry, Forum (2013). Lahouij, I. *, Vacher, B., Dassenoy, F., Bruhacs, A., et al. Diploma work orally presented at Minerva Student Symposium (2008) “Molecules as Sensors” in Tsfat, Israel, funded by the Weizmann Institute of Science and the Max-Planck Institute for Polymer Research. Bruhacs, A. *, Tremel, W.
Reference should be write here.